Hot on the heels of Allo's update over the weekend, Duo is now out with a new version of its own. Like Allo, its adaptive icon has been retouched to get rid of the infamous dinner plate look. While there aren't any other changes to the app on the surface, a teardown provides us with clues that Duo may support signing in with and being contacted through your Google account. Top: The previous icons. Bottom: Updated icons. It was pretty obvious a new icon was coming after Allo did it a few days ago. 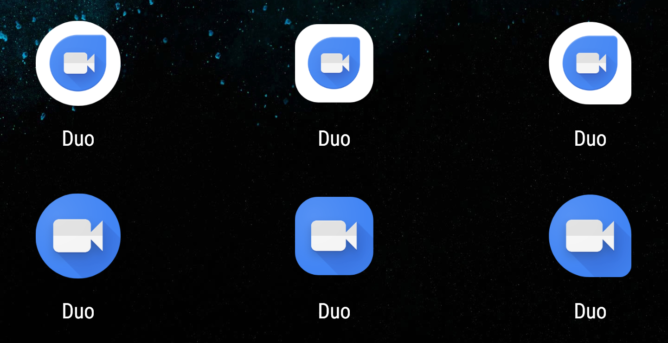 Duo's adaptive icon has been updated and now looks way, way less awkward. The white outer layer has been thrown out, leaving just Duo's blue as the maskable background. If nothing else, at least this puts an end to the really awkward look created by having the Duo icon paired with the teardrop shape (top right). Cheers to that! One of the early criticisms of both Allo and Duo is that they were linked exclusively to your phone number. There were a lot of side effects to this decision, but one of the biggest was that many people only had gmail accounts for each other, meaning they would have to exchange phone numbers to try out either app. This extra exchange of information won't be required forever, Duo is preparing to ask users to link a Google account with their phone number so they can be reached using either one. There's not much else to read into from the evidence, it clearly states that linking a Google account will make you reachable by either phone number or your email address. There are still two questions I'd like to have answered: Will this mean users will be able to activate Duo using just an account without a phone number, and what happens if you have two phones with their own numbers (e.g. business and personal) and decide to sign in both with the same Google account? We should probably also consider this a prediction for Allo since it already asks users to attach a Google account, but a phone number is still required for reaching out to other users. I wouldn't be surprised to see both Duo and Allo add Google accounts as a contact method at the same time, Allo just happens to have a head start in terms of getting people at linking an account. For a quick continuation of the Voicemail / Videomail feature discussed in the previous teardown, there's a little bit more text belonging to the interface you'll get when looking at messages you've received. They simply include the options to keep or delete a message, and there's also a separate button for calling back the sender. This is pretty simple stuff, but it clears up the couple of questions people have had about deleting messages before they expire automatically.